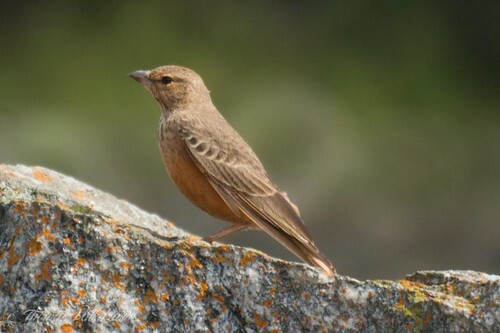 The Rufous-tailed Lark (Ammomanes phoenicura) is also called the Rufous-tailed Finch-Lark and is a bird of stony habitats. 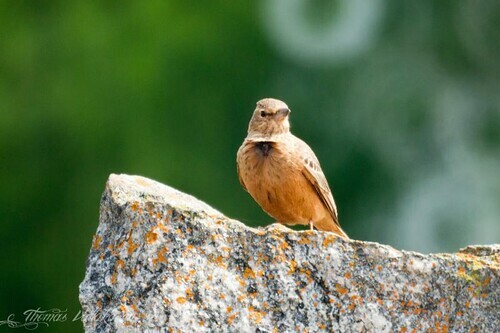 It has a dark brown upper plumage, the wings are brown with margins of a lighter brown. 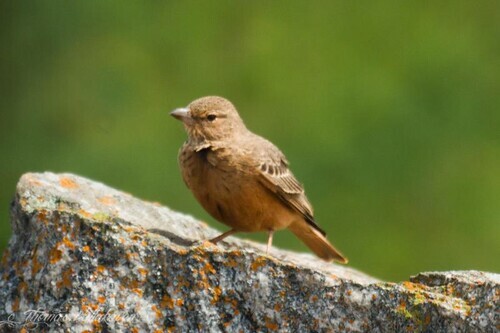 The tail and the entire lower plumage is a deep rufous with the chin, throat and breast streaked with brown. The tail has a a broad black bar across the end. 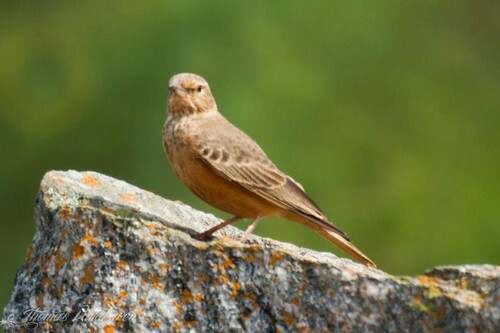 The sides of the head has mixed rufous and brown with a pale rufous streak over the eye. Subspecies and individuals may appear brighter or duller. Bill is thick brown and slightly curved. The sexes are identical. It is usually found in open plains and ploughed fields but can also be seen perched on wires. 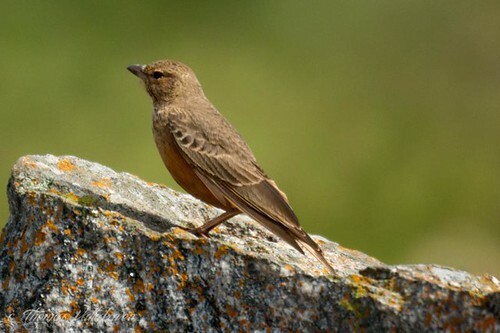 It may be seen singly in breeding season, but in groups otherwise. It normally keeps to the ground, where it feeds on seeds and insects. They walk along the ground and make quick dashes to capture insects. The breeding season lasts from February to April. The nest is a slight depression on the ground, made in open fields or plains, made by scratching or in a natural cavity. This is usually sheltered by a tuft of foliage or stone or mud. three-four eggs are laid. Other Details: Seen singly, sitting on a rocky area, quite unmoved by a rather large group of birdwatchers.